This is what spring looks like at my house. Beads, beads and more beads. Seriously, beads are everywhere, what a mess. I really have to finish cleaning my studio…and then it’s time to start getting into serious jewelry-making mode. Shows will be starting in June. And then I will be busy, oh so busy. But having so much fun. Fun is good. And soon I will be having some how-to’s for you about precious metal clay. I might like precious metal clay even more than beads. It’s amazing. You can shape it into anything. Last year I started doing impressions of actual leaves, really loved those. As soon as my garden comes out with something other than buds, I will be working on those again, too. Today is supposed to be 80 degrees here, I bet leaves will be popping out all over the place. Soon. You can’t be at the pole and the equator at the same time. Ohhhhh! Pretty beads!!!!! Love it! Oh how lovely! 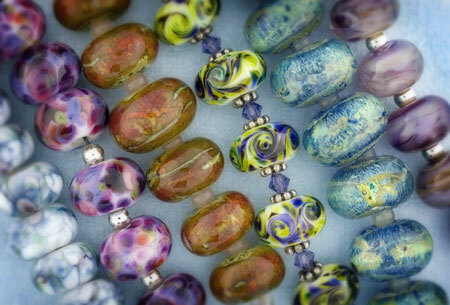 Purple, orange, turquoise… my three favourite colours and how beautiful they look in your bead beauties.